As lease cars are typically brand-new and as such can lose up to 60% of their value in the first three years. If your car is written off during your lease, you may find that there’s a significant gap between the insurance payout (as this is based on the value of the car) and the amount you still owe on the lease. Your insurance payout will only be for the value of the car which means you may still have a sizeable amount outstanding on finance to pay the finance company. And with over 450,000 cars written off each year, this can be a real problem to some. GAP insurance is designed to cover the shortfall between the amount you paid for your car and your insurer’s settlement figure based on the value of the car at the time of the claim. If your vehicle is written off and you have GAP insurance in place, you will receive the difference between the current value of the vehicle and the amount still owed to the finance company up to a specified limit. You lease an Audi A3 on a 2-year deal. 9 months into your leasing contract, you are in an accident and the car is written off. You’ve taken out GAP insurance cover so you don’t owe any finance on the vehicle that’s written off. In this example, if you didn’t have GAP insurance, you would have to pay the £3,000 outstanding to the finance company. With a GAP insurance policy, you would be able to claim for £3,000 on the policy to cover the outstanding finance. We partner with a company called Look After My Car who can provide you with GAP insurance for the duration of your lease agreement. 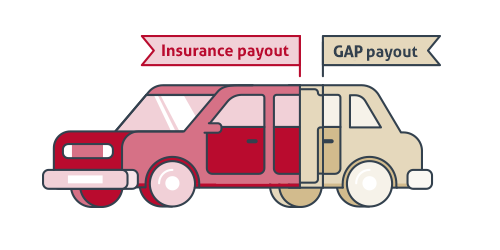 Their GAP insurance product pays the difference between the motor insurer settlement and the outstanding finance on the vehicle (subject to eligibility). Whether you decide to take out GAP insurance or not is a personal choice and depends on your attitude to risk. If you want to ensure that in case your lease vehicle is written off that you aren’t out of pocket, and that you can get a new vehicle on a new agreement with no debt from the previous agreement, then you may want to consider GAP insurance. The amount GAP insurance costs depends on a number of factors including the make and model of the vehicle and the length that cover is required. It can be anything from around £100 to £300. our GAP insurance partner, Look After My Car, provides GAP insurance from £199. There are calculators online which can provide with you with estimates of what the likely costs will be. It’s also worth shopping around and getting a number of quotes from different insurers for comparison. Just let your account manager know you are interested in taking out GAP insurance and they can arrange for you to get a quotation. This guide aims to provide the reader with an overview of what business leasing means, the factors involved in determining how much it costs, what the benefits are and how the application process works.